You worked hard to build up your emergency fund — and then you needed to use it. That's OK! That's why you had an emergency fund in the first place. Now it's time to rebuild that financial safety net (and your peace of mind). Here are six quick ways to replenish the savings. If your regular job is on a Monday-Friday schedule, you could look for a part-time weekend job. Retailers and restaurants are often on the search for dependable staff. You can also look for weekend positions in janitorial work or temp staffing positions. There are often various part-time positions available at any business or service that has to operate 24 hours a day, seven days a week. For example, elderly care homes, emergency services, and gas stations all need part-time help. You won't make big bucks at most of these jobs, but if you put 100 percent of your weekend paychecks into your emergency fund, you can rebuild it fairly quickly: If you net $150 per weekend, you can save $3,600 in six months of consistent weekend work. Seasonable businesses depend on the profits they make in the high season, which is sometimes only a few key months out of the year. For example, retailers depend on holiday sales, so they increase their people power accordingly, hiring thousands of additional workers. You could be one of those workers, bringing in a decent hourly rate for all those extended shopping times. If you're willing to put in overtime, you can seriously raise that seasonal paycheck. Working retail during November and December could net you enough to rebuild your emergency fund, and get you a sweet employee discount for doing your own holiday shopping. Other seasonal businesses include landscaping and lawn care companies, which get busiest in the spring and summer months. They often need additional help to do the landscaping work, and may also need help with office jobs, such as answering the phone, responding to customers, scheduling appointments, and handling invoicing and billing. Seek out the seasonal businesses in your area and apply for a position. If you have experience in any of the work that seasonal businesses need done, negotiate for a higher rate; since it's seasonal work, they don't have a lot of time to spend on training. If you can jump in at full-speed, you're worth a higher salary, which means your emergency fund gets rebuilt even sooner. You can approach selling your items in two different ways. First, you can do it yourself using online classified services and social media. With this method, you keep all the money but you have to do all the marketing and work yourself. Second, you can take your items to a resale shop that will take them in on commission or purchase them outright. You'll make less money, but the shop will handle the work of selling. Here's one important note on selling your stuff: If you have specialty items, such as antique furniture, jewelry, or collectibles, seek out an appraisal from a qualified dealer. General resale shops often won't know the value of specialty items. A dealer, however, can help you set a fair price that reflects the value and may even be able to help set up a sale for a fee. If you have any specialized skills or services, you can make the most of them now to rebuild your savings. Parents of young children are often searching for dependable, trustworthy care for their kids. And the hourly rate can be much more than minimum wage, depending on the area you live in. Provide references and make your child care services available through your local network of friends and social media. Local businesses often need help with social media, content marketing, flyer or brochure design, or script-writing for ad or television spots. How can you help? Put together a short list of your services and rates and approach local business owners via email, phone, or at their location. The list of services you can offer is really only as limited as your capabilities. If you have a hobby, special interest, or any sort of experience in something other people need help with, you've got a service to offer. If you have little time to spare, take a hard look at your budget. Cut down to absolute minimums on all your spending for the next three to six months, and dedicate the difference to rebuilding your emergency fund. While living on a bare-bones budget isn't a lot of fun, it helps to know it's only for a limited time. Once you rebuild your savings, you can revert to your normal budget. 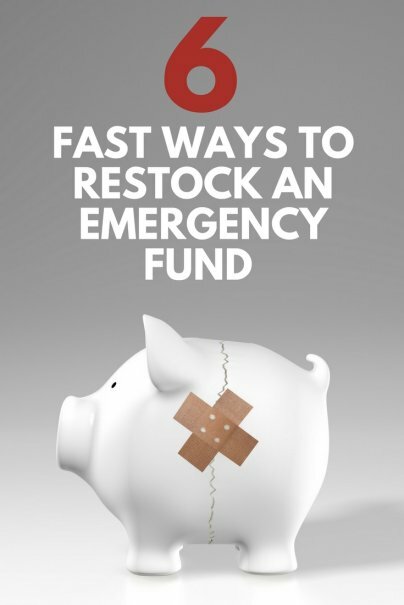 For maximum speed in rebuilding your emergency fund, combine a couple of approaches. For example, if you can sell some high-value items and also pick up seasonal work, you'll move that much faster toward a replenished savings account.